RawFishionado: Shibucho: Love the "Sushi Nazi"
I got a sincere smile and hearty thanks from the Costa Mesa Sushi Nazi last night! Score! 1. He was amused by my child-like Japanese. 2. He was entertained by my conversation with the talkative Japanese businessman sitting next to me. 3. He appreciated that my friend Kat and I didn't douse our sushi in soy sauce like the white couple at the end of the counter. He visibly grimaced watching that couple eat. Or, very simply, how could he not be happy with us when we enjoy his food SO MUCH? Kat treated me last night (THANK YOU, KAT!) to a belated birthday dinner at Shibucho in Costa Mesa, a hidden gem of a sushi spot (located next to an In-n-Out burger stand) where you can enjoy classic omakase presented by a classic "Sushi Nazi" chef-owner. Of course, we RawFishionados grant Mr. Shibutani that somewhat dubious title with great affection and appreciation. He provides pure, old-school omakase - simple but sublime nigiri sushi made with the freshest, highest quality fish. Exhibit A, pictured above: the red snapper, one piece served with the perfect dab of yuzu, the other unadorned and totally sweet in natural flavor. And he doesn't charge an arm and a leg for it. The Shibucho omakase typically sets you back $30 to $50. 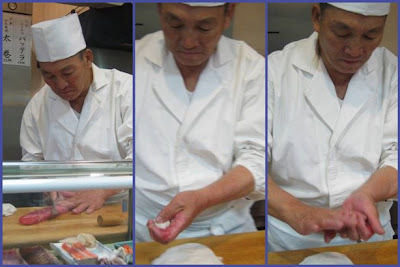 Plus, just watching Shibutani-san cut the fish is watching the epitome of sushi artistry. About five months ago, Kat and I first experienced Shibucho, after hearing/reading much about it on foodie blogs and Yelp. So incredible was that first visit that Kat and I had to write about it, enhanced by Kat's gorgeous photos. Shibucho has come up in my mind many a time since then, whenever I'm craving sublime sushi. But for one reason or another, I didn't get back over there until last night. Comfortingly, the quality hasn't changed. When I walked in, the only other customers in the tiny place were a single Japanese man at the sushi counter, and a table of about six adults (speaking Chinese). As I sat at the sushi bar waiting for Kat to arrive, Mrs. Shibutani brought over the requisite hot hand towel and a cup of good, strong, green tea. RawFishionado: Are you stewing kabocha or frying it for a dish today? Mr. S: We don't do tempura. RF: Oh yes ... so are you stewing it? Mr. S: No. (Pregnant pause.) Not today. Mr. S: You like kabocha? RF: Yes, I love it. Mr. S: You should make it at home yourself then. RF: Ah yes, well, my parents make it all the time, so I do get to enjoy it at their home. Mr. S (ever-so-slightly sympathetically): It is mendokusai (a hassle) to prepare. Tamago (egg), prepared perfectly: fluffy, slightly sweet. (The assistant sushi chef - Mr. Shibutani's son? - was carefully preparing it in a square flat-iron pan on the stove just minutes before it was served up). Served with garnish of grated daikon radish and a dab of soy sauce, providing the just-right touch of salt. Mackerel: I believe this was aji, less pungent than saba. Tender and fresh-tasting. Fresh crab leg and mirugai clam: Each one sweet and flavorful, tender and delicious. Anago (Saltwater eel): This piece had a dab of teriyaki or sweet soy sauce, but Shibutani-san also served up a piece in the traditional way, with just a sprinkling of salt. Both pieces were tender and moist, not dry and pasty like the anago that some lower-rate sushi bars offer. 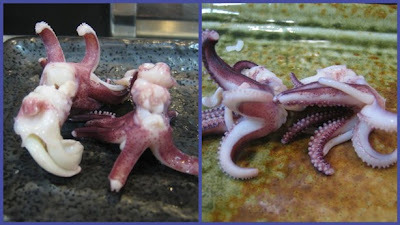 Tako (octopus): Tender and delicious, but I was struck most by the interesting shapes of our cuts. The left (mine) looks like an animal's head, while Kat's serving (at right) looked like plumeria flowers. Thank you, Mr. Shibutani, for delighting our RawFishionado stomachs - and souls. I just love your writing style! And again, your reviews make me want to go out for sushi. RIGHT NOW! Nice! Should be "by masking" and "cut up a"...lol. Guess I was typing too fast. Thank you, olemissdixiegirl - I totally appreciate your comments, because you're clearly a RawFishionado. And now you've fed my curiosity: where do you live?